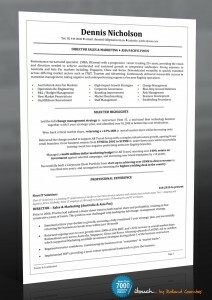 This is the 3rd part in a series of how to write a resume – giving you insider tips and secrets on how we produce resumes that really worked today’s market. Let’s address the issue of where to place qualifications. If you are starting off your career, and you hold suitable qualifications such as diplomas, degrees and certifications, then it makes sense to include this at the front of the resume. However, if you don’t hold suitable or relevant qualifications, for example a degree in environmental studies but seeking a position in finance, and where experience may outweigh the qualifications you do have, you may be better off using a skills summary at the start of the resume (skill index), and adding qualifications to the rear of the resume. In the IT markets, qualifications and certifications become more relevant based on the type of role you’re looking for and how current though certifications are. In this case, we recommend have in a front page with a mix of qualifications and IT technical skills (depending on the technical nature of the role). If your qualifications are somewhat outdated, then it may be better to include these at the rear of the resume, and focus the front of the resume on IT technical and a skills matrix. For accounting and finance, qualifications including that of CPA or CA with those that have up to 5 or 7 years experience tend to be more prominent at the front of the resume. However, as you move deeper into senior management such as group financial controller, financial controller or even CFO, it would be more prudent to have the qualifications towards the rear and have a summary in letter form somewhere in your opening profile for example “An experienced CPA, MBA with more than 15 years experience”. This can all depends on how you structure the resume and the front page as you may also want to consider a front page that has a professional profile, a skills matrix, selected accomplishments, and education. For academics, it would make sense to have this on the front of the resume. If you have been quoted and all been involved in numerous publications and conferences, you can summarise this off on the front page or consider expensive lists of publications to be added on the rear or as a link to your LinkedIn profile. For directors and CEOs and other executive roles, the same rules applies i.e. qualifications to the rear with letters in the profile or consider a summary type from page to include accomplishments, skills matrix and qualifications/education providing those qualifications suit MBA or other levels. This list can go on and on, and as we mentioned earlier there really is no hard and fast rule. It is definitely worth seeking feedback to find the right format that suits your background and your target market. Sydney, Melbourne, Brisbane, Perth, Canberra and nationally.